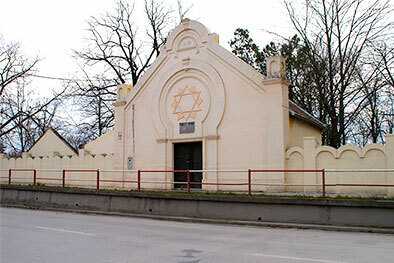 The Jewish community of Sereď was one of the oldest in western Slovakia and traced its origin to refugees fleeing Uherský Brod after a pogrom in 1683. The community reached its peak during the nineteenth century, when it joined the Orthodox movement. It was one of the largest Jewish communities in the region: In 1880, some 1,354 Jews made up about 27 % of the town's entire population of 5,004. Local Jews were active in business and they also owned the local sugar refinery. During World War II one of the three labor camps set up for Jews in Slovakia was established here. Internment at the camp saved about 500 Slovak Jews from deportation. The camp was also, however, used as a transit center for Jews being sent to death camps in 1942 and 1944-1945. The last deportation left for Terezín in March 1945. Plans are currently under way to establish a large educational center and Holocaust museum/memorial here. The synagogue was extensively altered after World War II, used as a gym and finally razed in 2000. The building of the former mikvah (ritual bath) still stands on Kúpeľné Square 11-12. The cemetery is well preserved and located on a level site in the southern part of town, on the road (Route 507) leading to Galanta. Established in the first half of the nineteenth century, it has several sections, including a group of Baroque tombstones that were moved here from an older cemetery. The most recent section is from the interwar period and features several fine granite tombstones; a few graves date from the 1950s and 1960s. A children's section is located near the eastern wall. The cemetery chapel from 1882, which has been restored, is a simple building that also serves as an entrance to the cemetery. A clearly legible Hebrew inscription with a Star of David faces the street. Inside the chapel the school has established a small Holocaust exhibition, which is used for teaching tolerance and combating racial hatred. Hours: No regular opening hours, but groups and special visits can be arranged through the site manager. The site is closed on Saturdays and Jewish holidays.